Santa Maria Subdivision is a master planned upscale residential community approximately one mile from I-10 in the most southeastern portion of East Baton Rouge Parish. The entire subdivision and the public golf course it surrounds are composed of approximately 400 acres. Santa Maria is approached from Highland Road down Old Perkins Road. Stately homes are set back from the road which is lined with trees to form an inviting canopy just as you reach the subdivision. A pigeonnier and great oak announce the entering parkway which is banked by softly rolling mounds laced with native Louisiana plants…live oaks, crepe myrtles, azaleas and magnolias. More than 15 lakes are scattered throughout the residential area and includes nature and jogging trails, a park, tennis courts and even a chapel in the woods, all partially bounded by a navigable creek and a boat launch. The homes may be best described as “Country French”. The prevailing character of the subdivision and its amenities are carefully preserved by comprehensive restrictions. Santa Maria has been recognized by over a dozen awards in the “Best Of” category for residential development. 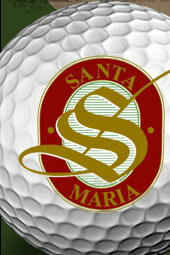 It was begun in 1992 by developer Charles J. Cole, III who purchased approximately 250 acres of largely rural land immediately surrounding the Santa Maria public golf course. Over the next 14 years his remarkable vision and infinite attention to detail has yielded one of the loveliest residential golf communities in Louisiana.